Saint Peter tells the epic story about the key event in European and World history, the spread of Christianity throughout the Roman Empire, focusing on the leader of that new religion. 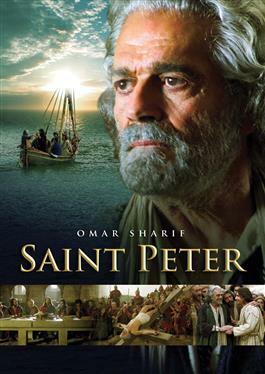 St. Peter is played by the renowned Egyptian actor, Omar Sharif (Lawrence of Arabia, Doctor Zhivago).The film illustrates the strong reaction of Romans and Jews from a political and religious standpoint, and it also deals with the immense obstacles Christianity found along its path in the early stages of its development. As a dedicated follower of Christ, Peter spreads the message of the Gospel across the land, often staying only one step ahead of those determined to persecute him. As the tension between the Christians and the Romans grows, blood runs in the streets. Peter and Paul meet and together they form a strong friendship in preaching about Christ. While fleeing persecution in the Eternal City, Peter sees Jesus walking toward him saying, "Peter, I am coming to Rome, to be crucified again." Peter realizes he must follow Christ to the end, and returns to Rome to be crucified like his master.